There’s nothing quite like having Lindy Hoppers who love vintage clothing in a vintage store. Add in the fact that Victor actually dresses people for a living, and you have an all out game of let’s-play-dress-up. What’s that song on the radio? Can you turn it up? Sure, but only if you dance for us. Dancing ensued to a selection of excellent vintage jazz tunes, upon the request/permission of the Halcyon staff. We love you gals! Elizabeth T. managed to build an entire outfit around a lovely black 1960’s cocktail dress, complete with gloves, hat, and jewelry. Elizabeth A. was drawn to Halcyon’s selection of lovely coats and a fantastic green turban/cloche (did you go back and get it?). Matthew picked up a sweet blue wool jacket with a belted back. Maurice left with an entire 1930’s tuxedo, which fit like it was made for him. Victor was all over the store, checking in on the dressing rooms and putting together Maurice’s tuxedo ensemble. The Halcyon staff scurried to find whatever Victor could think up and never came up empty-handed. We spent over two hours at Halcyon and I think everyone left with at least one vintage item. Next, we headed to Bygones, which has a mix of vintage and vintage reproduction clothing. It was great to browse their selection of Trashy Diva and Leluxe dresses, to actually see them in person and try them on. There were some other great reproductions and, if I had been paying attention instead of being distracted by the feather fans, I would have written down the brands. Bygones also had an extensive selection of Aris Allen dance shoes, which I’ve never seen outside of the internet or the Aris Allen store. Bygones had some lovely vintage clothing from the swing era, but none of it was in my size. Perhaps the most impressive part of Bygones was the window display. I’ve been told they go all out for the window dressings and this season’s feature vignette was a Victorian spider lady, ensnaring a dapper gentleman in her web. If you find yourself in Richmond, you must visit one or both of these stores – that they co-exist in the same town and have such amazing selections is remarkable. I can’t wait to go back! The fabulous green turban-cloche hat, modeled by Elizabeth A.
I was in love with this dress, but was informed that it used to belong to an opera singer with a giant rib cage. Former home of a top hat. The window display at Bygones - check out the extra booted legs on the spider lady! A wall of Aris Allens! And....we're done! Time for a nap before the Saturday night dance! 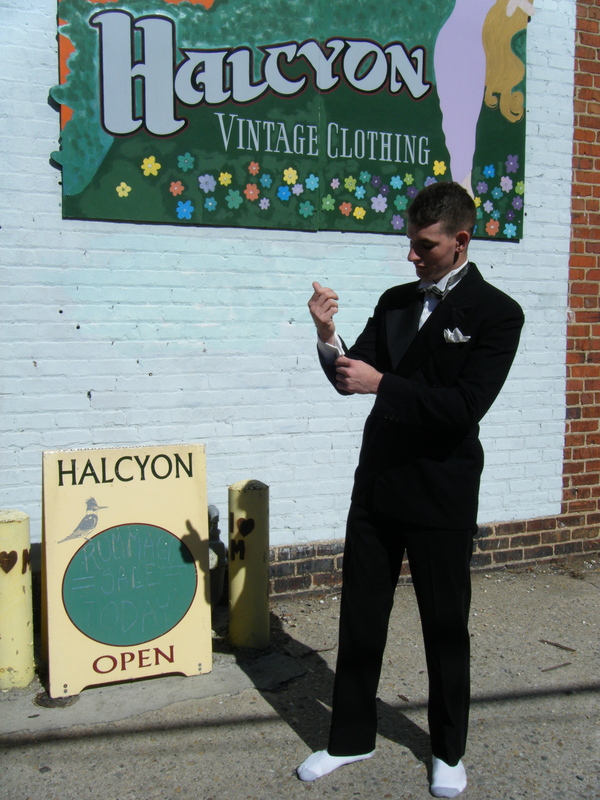 This entry was posted in 1920's, 1930's, 1940's, 1950's, Events, Vintage Stores and tagged Bygones, Halcyon, Jammin on the James, Richmond, store, vintage, Virginia. Bookmark the permalink. Awesome, report! We are very spoiled here in Richmond. Not that I’m complaining.